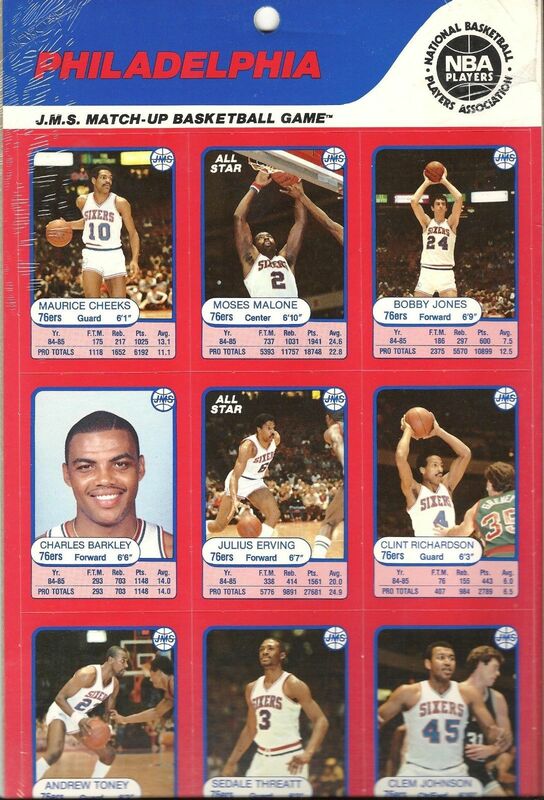 The 1986 Fleer Charles Barkley rookie card is one of the most recognizable rookie cards in the hobby. Barkley's legacy as one of the game's all-time greats is unquestionable so this card is a must-have for any basketball card collector. That said, here is a comprehensive guide that covers the key things you should know before you buy or sell. The first thing most collectors ask is: how much is a Charles Barkley rookie card worth? Distinction: This is his only recognized mainstream rookie card. And in a set loaded with Hall of Famers and rookie cards of some of the greatest basketball players of all-time, Barkley's card is one of the keys. Other great rookie cards in this set include those of Michael Jordan, Dominique Wilkins, Patrick Ewing, Karl Malone, Hakeem Olajuwon, Isiah Thomas, Chris Mullin, James Worthy and Clyde Drexler, among others. Number: This is card #7 out of 132 total cards in the set. Design: The design of the 1986 Fleer set is instantly recognizable with its red, white and blue borders. An inner yellow border helps frame a great action shot of Barkley going up for a monster jam. I've always loved the photo that Fleer chose to go with for this card as it highlights the force and power with which Barkley played his entire career. The Fleer logo stands out in the upper right corner while his name, position, and 76ers team name are all shown along the bottom border. Reverse Side: The reverse side of the card is also printed with a vertical layout and features Barkley’s personal information and stats from the previous two seasons. Unlike many other cards of the day, there is no brief write-up of any of Barkley's career highlights or promising future so the back is kind of boring. Condition Issues: Chipping and wear showing along the colored borders are some of the main issues with this card. Centering can also be an obstacle for collectors looking for a copy in high grade. 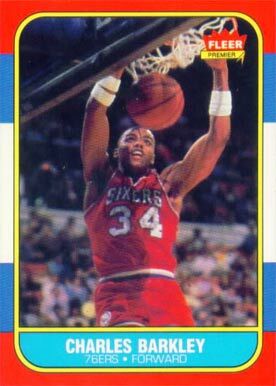 Prior to the release of the famous 1986-87 Fleer basketball card set, Barkley did make appearances on a couple of other cards. Although, they aren't considered rookie cards, I figured I'd mention them anyway since they are popular among Barkley collectors. This is the very first card to feature Charles Barkley. And the famous Karl Malone is pictured right there alongside him. The card is rather plain-looking with its black borders and simple photography that screams 1980's Nike style. But, how can you argue with a card featuring two of the game's all-time greats at the same time? The 1985-86 JMS Match-Up Basketball Game Cards featured three of the league's top teams, the Boston Celtics, the Los Angeles Lakers, and the Philadelphia 76ers. The front of the card shows a nice photograph of Barkley surrounded in a red border, with his statistics from his rookie campaign at the bottom of the card. The cards were issued on an uncut sheet, one for each team, with nine players pictured (shown below). The two base cards from the 1984-1985 and 1985-1986 sets are shown here. PSA will no longer grade these cards but in mint condition they can cost several hundred dollars. Charles Barkley was one of the greatest players to ever play the game of basketball. Although he was small for a power forward, he used his incredible strength to overcome that obstacle to be one of the greatest to ever play the position. In total he spent 16 seasons in the NBA with 8 of them being as a member of the 76ers, 4 with the Suns and 4 with the Rockets. Known for being extremely productive, he is one of a short list of players to achieve 20,000 points, 10,000 rebounds and 4,000 assists. Those are just some of the amazing accomplishments that he'd put up over his Hall of Fame career. He was inducted into the NFL Hall of Fame in 2006.